It happened again last night when it came to tipping. The check arrives and the server says, “No hurry when you’re ready” as the bill is placed on the table. I’ve made enough decisions for the day and now I have one more with great consequences. You think the decision is how much do I leave for the tip? No, it’s now is my tip really going to help the woman I’m leaving it for? In the past, I never gave much thought to tipping. But, then in thinking back, I realized I’ve been moving through different tipping stages. Extra Thank You Stage – I thought tipping was a thank you for extra or attentive service. Taken Advantage Stage – I become aware of management’s minimal per hourly rate and the expectation that I the customer subsidize their employee’s salary. The New Reality Stage – I realize my tip is an added-on cost of my dining experience that may not fully benefit the person I’m tipping. Women make up 72.9% of tipped workers (2005). When compared to men, women earn 83 cents less per hour because they are more inclined to be working in the fast food industry than restaurant dining. Restaurant employers are supposed to make up the difference between a tip worker’s salary and tips and the federal wage of $7.25/hr, but many workers don’t know about the law and are taken advantage of. A tipped employee engages in an occupation in which he or she customarily and regularly receives more than $30 per month in tips. An employer of a tipped employee is only required to pay $2.13 per hour in direct wages if that amount combined with the tips received at least equals the federal minimum wage. If the employee’s tips combined with the employer’s direct wages of at least $2.13 per hour do not equal the federal minimum hourly wage, the employer must make up the difference. 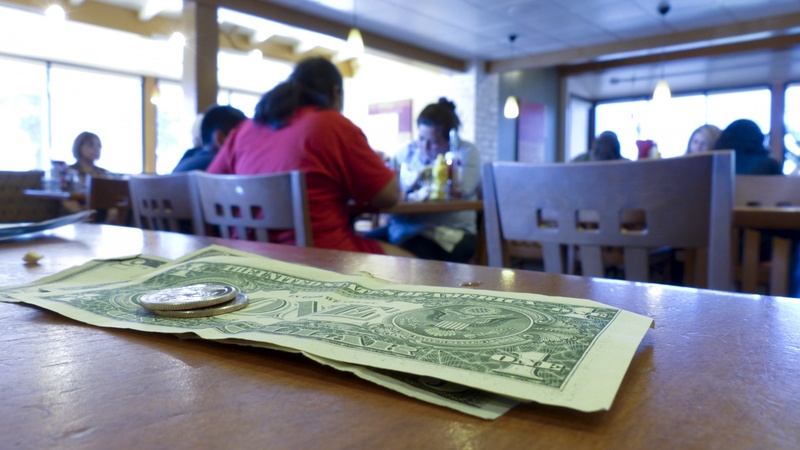 Many states, however, require higher direct wage amounts for tipped employees. Women make up approximately 67 percent of all tipped workers and 69 percent of servers and bartenders. Single mothers are 16% of waiters and bartenders; parents are 24%. Under the previous administration, tips belong to those who earn them. The Department of Labor is now considering legislation to address income disparity. With the support of the restaurant industry, they are proposing that all tipped workers pool their tips. Pooled tips are then shared with others (back-of-the-house workers and other non-tipped workers) and possibly management as well. This would apply to employees who are being paid the federal minimum wage of $7.25 per hour. The concerns and fear are that management will be the arbiter as to how much tips are shared if any. The counter-argument is that by pooling tips, all employees benefit who contribute to a customer’s dining experience. Management who would deprive workers of their tips would face the loss of workers and legal consequences. First, the loss of workers. The restaurant industry will always find workers because people who need an income generating source will be there, even if it’s a supplemental income to another job. Also, like any other businesses where the market is competitive, a business will pay more to attract the workers it needs. Second, facing legal consequences. There have been a few cases of workers bringing tip-related lawsuits against management. However, most tip workers are not unionized or have the means or access to legally engage in a protracted court action. For management, it would be tempting to control worker income and use tips to offset the higher hourly wages. As states raise minimum wages to compensate, the industry is also looking for additional ways to save. There might just be a robotic waitress or smartphone app in your future. Next time you’re paying your check, know that your tip may be about to be shared beyond your waitress or server. And, for the women who rely on tips, they lose again. Thanks for collecting this information on tipping Joyce. It is sad that women suffer the most here. On a side note, are you aware that tipping started when black slavery ended because the ex-slaves were not paid enough to sustain themselves. They relied on tips to survive. I did not know that Rachel. I never thought about where the practice originated. Thanks for adding to the story. What a terrific article that opens our eyes to the realities of tipping. I have always been a good tipper. I start my experience with a 20% tip and it can go up or down from there depending on the experience. I learned that in Australia, restaurant servers make $15 p/h and most people don’t tip. When I have an exceptional service experience, I sometimes tip 25-30%. I find that it influences the kind of service I get in future visits. I’ve never had a job where tipping was an option but I appreciate these workers a LOT. I also tip food delivery people, maids – when traveling, and sky cab agents when checking in bags. I look at it as paying it forward. Oh yes, Tandy. Service workers do remember the good tippers and they are more than happy to give you great service the next time you visit. Also, you’re right on about paying it forward. The law of reciprocity applies to money too. It seems like something should be done. I think tips are silly. We should be billed straight up and people should be paid a fair wage. That would be nice, Cathy. Businesses need to get far more equitable about paying workers a fair living wage. I think your argument makes a good case for using Glassdoor to look up company details before dining out. The places we frequent the most have pretty good reviews on Glassdoor from employees across the spectrum. They’ll comment on salaries and benefits too, so I know if a restaurant or store offers healthcare to employees. I do wish more employees in Tucson used Glassdoor. When I looked up Beyond Bread (after an unusual negative experience there), there was one negative review. It’s hard to gauge if that’s the company norm or not. Maybe with time Tucson will become a little more tech savvy. Wow, I did not know about Glassdoor. I definitely will be checking it out, Irene. Thanks for the heads up! Your stages of tipping are highly relatable! I went thru them as well. The way the restaurant industry works is disappointing and doesn’t seem like a mutually beneficial environment. While splitting tips can be a bad situation, there are other times when it may help. For instance, in the salon industry there are often several people who wait on you but often only one who gets tipped. Personally, I’m tired of taking on the financial burdens of businesses. Employees should be treated better. I’d rather see a standard and livable hourly wage and remove tipping from the equation entirely. Thank you for an eye opening post and one that I will recall every time I come across a tipping situation. I try to live by the policy of being generous, and you’ve confirmed it’s a good policy! Many of the commentators have expressed the same feelings for having a living wage and doing away with tipping altogether. However, I think businesses are more inclined to want to pool tips so they don’t have to raise the wages of employees who do not provide a direct and personal service to the customer. Yet, no one wants to talk about the excessive profits that are taken at the expense of workers. I believe everyone should begin life with a job in a restaurant to understand a service they will use for a lifetime that requires respect for the server and the business. Women restaurant workers also deal with poor behavior beyond the norm. Yes, how women are poorly treated is another aspect of the restaurant business that needs to be addressed. Yes, everyone should have a restaurant experience. I know many who tip well because they have been there themselves. Thanks for commenting Jilly. This was a very interesting post. I had no idea about the laws when it came to tipping. I did know that for bartenders, the base salary was extremely low (my youngest stepdaughter worked as a bartender for a summer) yet the tips were very high. I personally would like to see a no tipping policy. Too many times, I’ve seen service given by someone that didn’t deserve it and I’ve started to either not time or give 10%. I resent tipping someone when the food or service is unacceptable. If the salaries were where these people are able to have a living wage, I think we might all benefit from it. For myself, eating out is for pleasure. Thanks for sharing the how tipping really works. This can be a real problem and a failure on the part of management to oversee that certain service standards are met. Also, as a customer, you don’t know whether the tips are pooled, which means others do not benefit because of a poor server. Living wage salaries may eliminate tipping, but I don’t think they will improve customer service unless management makes an effort. Thanks for sharing your experiences. Joyce, I felt really sad when I read this. I still can’t believe in 2018 that women are not paid at least as much as men. Education is so important for women to move out of poverty and working for peanuts. My daughter was working in Virginia and that was the first time I became aware that servers can be paid as low as $2.13 an hour. We need more women in government making these decisions. Washington state where I live, the minimum wage is moving from $11 an hour in 2017 to $11.50 in 2018. I am grateful to live in a state with a higher level of consciousness. I employ people to get out and vote locally. This is where these changes begin! Hooray, Candess for being on the bandwagon. It riles me to no end to see the big mucky-mucks flaunt their wealth at the expense of exploiting workers, especially women, at the lowest pay possible. I believe that women will no longer take a back seat and there will be a significant distribution of wealth as they come more into power. I like your diverse yet cohesive topics. I never worked where I received tips but my daughter has – from waitress, bartender and now she even gets tips as the owner of a small boutique salon. I think this fad taught her a lot. I noticed she goes above and beyond when it comes to tipping and I see her joy when she sees their joy. I’ve noticed this among business owner friends who receive tips themselves. They are great tippers, and how lovely that your daughter is among them. Oh dear. It’s no longer simple, if it ever was! What an interesting post, Joyce, and thank you for raising awareness on this topic. I’ve often been confused myself on what to tip those who expect tips but who are not in the restaurant business. A friend who is a massage therapist was very upset recently when the front desk let a customer leave without suggesting a tip. We’re coming to understand that salary alone is not enough for one to earn a living on.